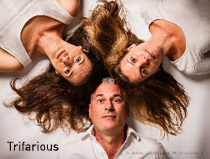 Trifarious is a diverse and groundbreaking trio that brings together the like-minded forces of Tim Redpath (clarinet/saxophone), Rachel Calaminus (violin/viola) and Nadine André (piano), amalgamating classical, jazz and world influences into this diverse instrumental combination. Breaking away from the standard trio format through its diversity of instrumentation, Trifarious sets out to broaden the spectrum of the trio genre. The five sound worlds of clarinet, saxophone, violin, viola & piano are all at the disposal of both us, the performers, and the composers we commission and première. Trifarious also aims to share it's enthusiasm for contemporary music with young people and having already given workshops in schools across the country, will continue to motivate and work with both the youngest musicians and more advanced, established students. Following a successful launch concert at The Forge in London last May, we have had the privilege of recording in the Anniversary Halls at St. Catherine's School for Girls, Bramley, over the Summer. Click on the links below to see the results. More are always coming! After showcasing some of the fantastic music that was written for us in our inaugural year, we are now preparing to give our second major concert at St. Martin of Tours in Epsom on Saturday 30th November this season. We chose this venue because of my connection to the area. I grew up in Ewell and have great personal affection for the surrounding area, especially Epsom. I am delighted to be bringing this exciting new music home and we are all extremely grateful to our sponsors, especially the Surrey Physiotherapy Clinic, Krinkles hairdressers and Greenfield and Company,for supporting the trio and making what we do possible. Also look out for Trifarious in 2014 at St. James's, Piccadilly, and at contemporary festivals across the country in 2015. As well as appearing on mostentertaining.com, my blog "For The Love of It" was published on The Forge's website. Have a peek >> - all feedback welcome! After their first series of concerts in 2012, the trio is playing together again after a short break during which time the celiist, Pippa Rans, gave birth to a baby boy! A few months later and Benedict attends their rehearsals, always making sure they stick to the job in hand and play to their very best! The trio's début at the Ship Theatre in Sevenoaks in 2012 was a great success and they will be performing there again in 2014, as well as in lunchtime recitals in London and the south east. Keeping along the same lines, their new programme will include works by Beethoven and Mendelssohn, alongside the Argentinian fire of Astor Piazzolla! Concerts will continue to be listed on the Diary page, so continue to look out for upcoming concerts given by the trio. Also visit the trio's website at www.thekingswoodpianotrio.com for more information about what they do! Classical Babies is going from strength to strength and with the population of little people on the increase, Surrey will be starting it's new venue in January at St. Martin of Tours, Epsom, as well as continuing to hold monthly concerts in both Kingswood and Teddington. See the new Classical Babies page to find out about our concert series for mums and babies across London! I have succumbed to the idea of writing short articles on anything I fancy (within reason) and have set up my own blog site “Who Is Listening?” at www.nadineandre.blogspot.co.uk. My first blog is about Classical Babies and there will be much more to come. All feedback is welcome! 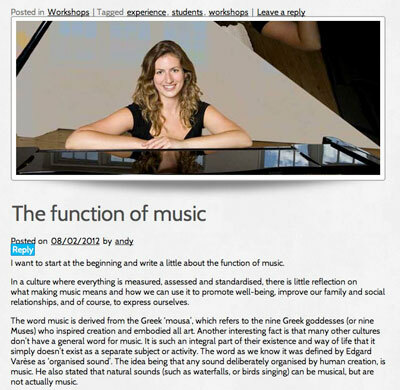 I also accepted the invitation to write regular blogs for the fantastic music and teaching website, Most Entertaining! It’s a great site run by two fantastic musicians; pianist and composer, Will Pickvance, and my good friend and trumpeter, Finlay Hetherington. They believe that music should be accessible to all who want to learn, at any age and any level. Their website is designed to match students to the teachers that will be most suited to them, and therefore to help each and every student get what they personally want from learning music. Brilliant! Having been invited to play a solo recital at The Forge, Camden’s coolest music venue in October this year, I’m taking the opportunity to play three world premieres, one of which I have commissioned especially for the concert. I’m excited to be premiering Rain, originally written by Paul Cavaciuti for jazz quartet, and arranged for me on solo piano. You can hear his original composition on his website. I will also be performing Ash Madni’s Toccata - Jazz Variations for the first time which will be challenging but a lot of fun. Inspired by hearing her ever-so-funky, up-beat arrangement of It’s Too Late by Carole King, I have asked jazz pianist, composer and arranger, Meredith White to write a piano piece for me which I’m very much looking forward to receiving! These compositions will be included in a programme of music by Britten, Debussy and Chick Corea. It’s going to be a fabulous event, so do come along! 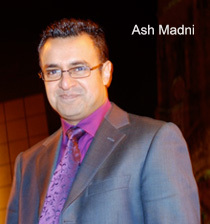 Ash Madni is an up-and-coming Oxford-based composer who I met on Twitter a few months ago. Both interested in each other’s work, Ash sent me some of his music to listen to, and I love it! Expressing a particular interest in his piano trio work, and following communication with each other over several months, he is now working towards a launch concert of his trio compositions and I look forward to playing his music with the Kingswood Trio in venues both in and out of London! Information regarding future concert dates will be published here and on the Diary page as soon as dates are fixed. “This new year is an exciting time for me personally. My violin concerto in E, Sounds from the bazaar, was performed by the Ten Tors orchestra on the 11th of Feb. This is to be followed by a series of piano trio concerts, firstly with the Kingswood trio under the leadership of Nadine André and then with the Bristol Ensemble. 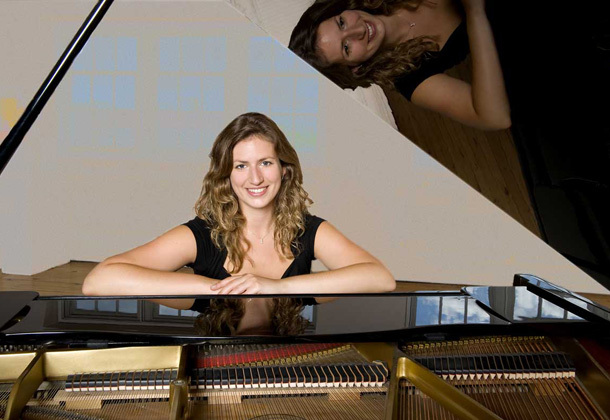 Nadine is a passionate virtuoso concert pianist, with an infectious drive and enthusiasm both of which I deeply respect and admire.